Where should Hostas be planted? What type of soil do Hostas like? What amount of light do Hostas need? What amount of water do Hostas need? How should Hostas be spaced during planting? 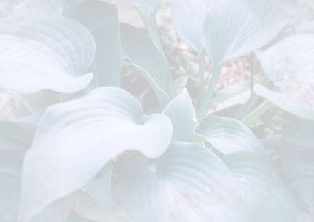 What hardiness zones can Hostas be planted in? What type of fertilization do Hostas need? What diseases or pests are found on Hostas? When is the best time to divide Hostas? A hosta is a non-bulbous lily that is a shade tolerant, hardy perennial plant grown principally for its foliage. These plants are native to Japan, Korea, and China. The leaves are green, blue, gold, or white, and may have single, solid color (except white), or have the colors mixed with the center or edges variegation. Preferring a well-drained location, hostas do best in shade or semi-shade. As a general rule, the gold and yellow colored varieties get their best coloring when given slightly more sun. Hostas prefer a moist, light, humus-based acid soil. The soil should be rich in organic matter and it can be any form: peat moss, compost, rotted or composted manure, rotted sawdust, or composted leaves. By Adding large quantities of organic matter, it improves the moisture retention of the soil, the aeration of the soil, loosens the soils for easy root penetration, and improves the microbial life in the soil, and its general fertility. The more easily the roots are able to penetrate the soil, and have nutrients available the lusher, larger, and faster the plant will grow. Each variety of Hosta has a different light requirement, so you can plant them in almost any light situation. Blue hostas prefer more shade while gold hostas tolerate sun quite well. As a general rule, the gold and yellow colored varieties get their best coloring when given slightly more sun. Hostas need regular watering during dry spells in the summer. Hostas need room to grow and mature. They need a minimum of two seasons in one location to mature and show their adult potential. When planting, space the small-leaved hosta between 18" to 24" apart; the large-leaved hostas should be spaced 24" to 30" apart. Hostas are hardy in Zones 3 through 10. Plants tend to grow larger and produce more intense, bluer and greener coloration in colder climates. It is best to test your soil first to see what nutrient needs are deficient in your soil. A fertilizer that is high in nitrogen will be beneficial, giving greater grandeur to the foliage. The first application of fertilizer should be early spring, just as the Hostas are emerging from their winter dormancy. At this time they require larger amounts of nitrogen as their foliage is expanding. A 20-20-20, or 20-10-10 formula is best early in the spring. After the foliage has fully opened, they will begin to put out root growth, and thus use more potassium. Another application of fertilizer in early summer, lower in nitrogen, such as a 10-20-20 will benefit. Do not over fertilize Hosta plants or let the fertilizer have contact with the leaves. This could cause the leaves to burn. Hostas are virtually disease-free, and the major pests are slugs and snails. They chew holes in the hosta leaves and make them unsightly. The slugs leave slime trails or shiny squiggly lines along the soil and they are most active at night and on cloudy days. One method to control these creatures is to pick them off by hand and drop them in soapy water. Not any fun to say the least; too goody and icky. They like to hide on the undersides of the leaves. Another method is to place small trays filled with beer, with the rim just above the surface of the soil. The yeast in the beer will attract the slugs and they will HOPEFULLY fall in and drown. They are not good swimmers. An effective control is diatomaceous earth. It is a powder of the finely ground shells of ancient sea creatures. It can be sprinkled on the plants and ground. As slugs crawl over the powder it scratches their soft bodies and the slugs die from dehydration. Hostas do not need regular division to keep them vigorous. Hostas can be left undisturbed indefinitely, but when division is necessary, divide in the spring just as the plant pips are emerging from the ground, so the new foliage is not damaged. If the plants are left undivided, you can enjoy their mature beauty sooner; otherwise, the plant will take longer to become fully mature.